The platform supply vessel Larus collided with Petrobras’ FPSO P-35 at Campos basin field off Brazil. The accident happened last Friday, but was reported by the offshore operator just now. 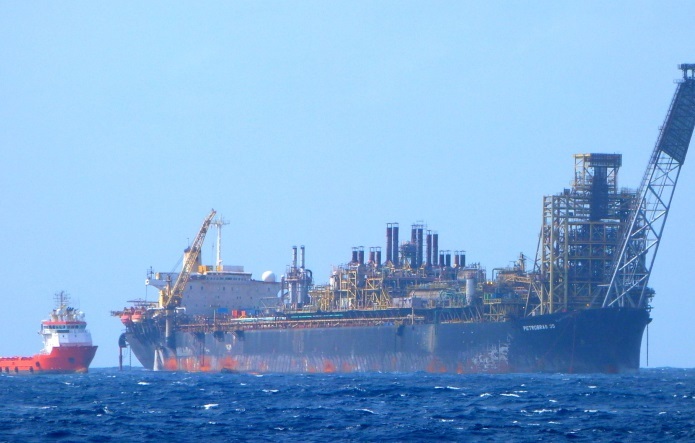 The floating, production, storage and offloading unit was being supplied with water, when the wind pushed the platform supply vessel to the FPSO. Following the collision the lifeboat on the supply vessel was damaged. Fortunately on board of the both vessels there were no reported injuries and no damages to the FPSO. The production of Petrobras’ unit P-35 was not affected, but divers were ordered to have inspection to the underwater part of the hull at the area of the accident. The accident was reported to the local authorities and support vessel was subsequently stationed beside the floater. The investigation for the root cause of the accident was initiated. There are no report for injuries or water pollution. The Marlim discovery is located at about 800 m of water and started oil production from Oligocene turbidite sandstones of the Carapebus formation. The FPSO P-35 (IMO: 7351783) has overall length of 320.00 m, moulded beam of 54.50 m and maximum draft of 28.00 m. The deadweight of the ship is 270,358 DWT and the oil production capacity is 100,000 Bopd and Gas Compression capacity is 3.0 Mmscmd. It has Storage Capacity of 2.0 Mmbbl and Offloading capacity of 150,000 Bopd.